My workshop is located in the very heart of Dublin city, tucked away in a little, quiet lane. The place is called Moxie Studios and it is an old, a bit dilapidated cluster of buildings where designers, artists and craft-makers rent their work spaces. My studio is hidden in the basement, very much out of the way, so I hardly ever see anybody unless I make an effort to make a trip upstairs and have a cup of tea with one of my maker-friends. 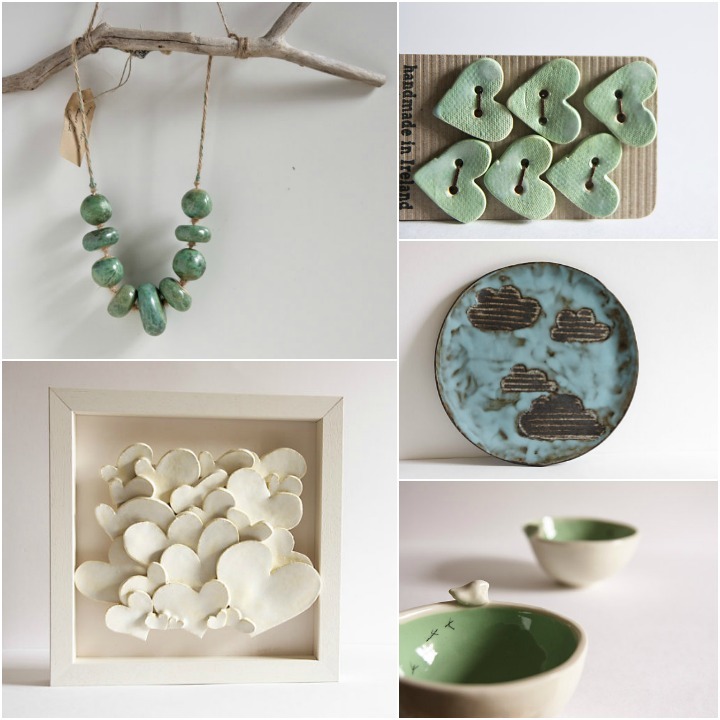 I discovered ceramics by pure chance and fell in love with it right away. I got two bags of clay as a gift and simply started playing with it- that's how it all begun. I learned the craft through trial and error, with great help of people who new about ceramics, through studying books and online resources and tutorials. And I'm still learning, that's what makes it all so exciting! I love simple understated forms and strong colors. Nature is my main source of inspiration and I'm drawn to all that's whimsical, magical and a bit surreal. I love fairy tales, myths and fairy stories which influence my designs by giving them a naive, childlike simplicity. My kiln is my pride and glory. She's the most important element of my studio equipment and she'll be 1 year old soon. 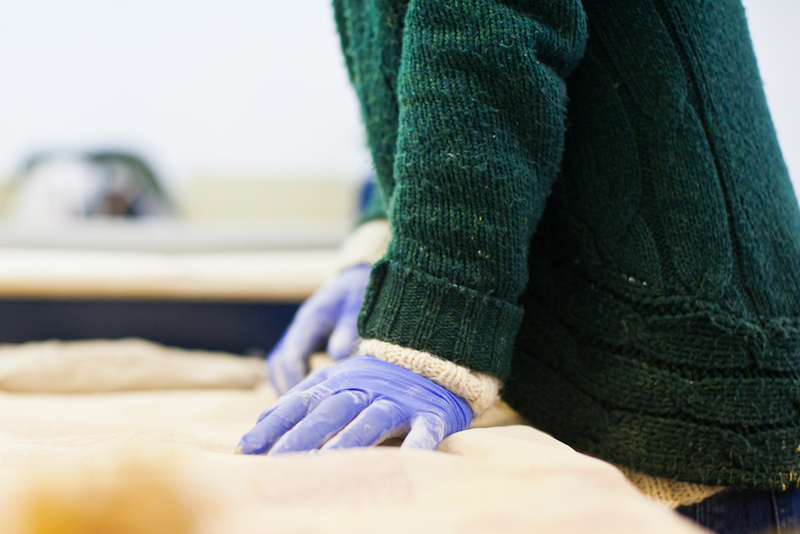 The second most important tool is the slab roller- it is like a giant rolling pin attached to a table. It rolls nice and even slabs of clay and saves my arms a lot of energy and effort. And finally my two hands; they do all the hard work and I'm learning to take better care of them by wearing protective gloves whenever possible, doing some stretching exercises and keeping them warm. I hardly ever work in silence. I either listen to music or my favorite local talk radio. And I just switch from one to another. I have wood carving neighbors down in the basement , so I had no choice but to get friendly with the sound of of mechanical saw. I love the element of surprise. 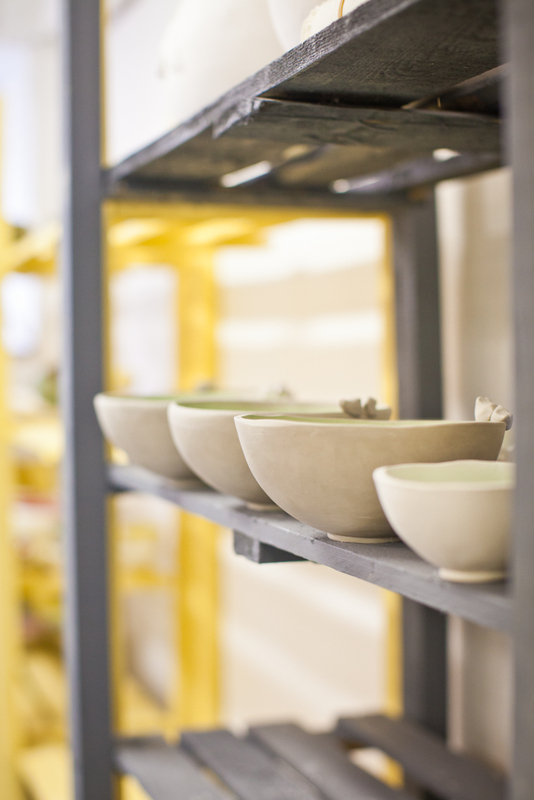 The process of making ceramic objects is quite long in terms of time span. 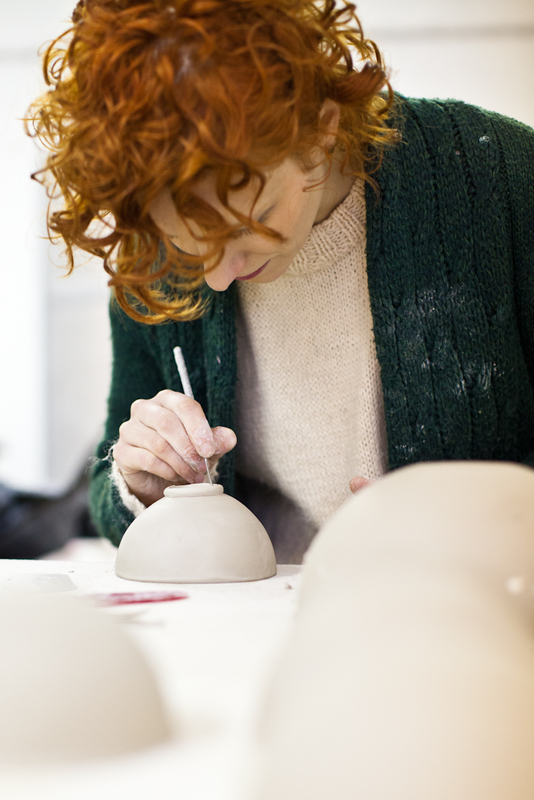 It takes at least 2-3 weeks for every object to be made- that's from the moment of initial shaping it up in clay to the finished product. Therefore I always anticipate the moment of opening up the kiln after the final glaze firing- especially if I'm working on something new or a custom order. I myself often buy and cherish handmade. I especially like those pieces that I use in everyday life; it's just nice to have those special, meaningful objects around you. Karo with one of her Tweet bowls. A special thanks to Christine Burns of Christine Burns Photography, http://www.christineburnsphotography.ie/ for the beautiful photographs of the studio. A big thank you to Karo for sharing her gorgeous studio! Check back with us next month for another fun studio tour.